"I can never be a foster parent. I'd get too attached." If I had a dollar for every time I heard this. In fact, I hear it almost every single time me being a foster parent comes up. So, I want to clarify a little something. 1) I am not some woman with the super power to love and attach only to the extent that it won't hurt me. That super power doesn't exist. I loved Leyla and I love Baby Z as though they were mine. I fight the inclination to post a cute Baby Z photo on FB every day. I am proud of every single milestone. His eyes melt me, and his screams can dissolve me to tears. I love to hold him and play with him and get those super cute laughs. His snuggles are the best. You could even say I'm attached. And it will hurt to say good-bye. So if you are the kind of person that would get "too attached", congratulations. You'd be a great fit as a foster parent. 2) Attachment is kinda the point. Ok, so I would love to hear about the last time you stopped by your local orphanage. Seriously. If you have visited an orphanage here in the states, please comment and tell me about it. But... My guess is you've never seen one. Right? That is because the US got rid of orphanages. Why? Because of attachment. When a child doesn't form a bond to a person before the age of 2, their ability to function as a normal person is severely impaired. And that bond was not forming in a group home or institution. A kid needs a family. Our family for instance is a little crazy. 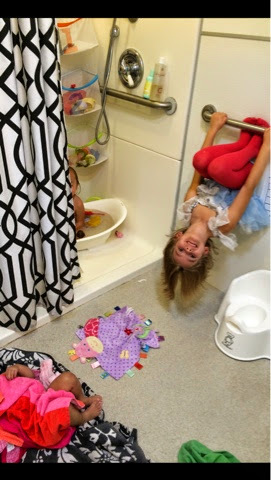 Our kids hang from walls, literally. So maybe we aren't perfect. But we are loving. And we're available. Bio is of course first choice. But when a bio family can't provide that bonding in a safe and loving atmosphere, enter foster families. Enter me. And Cari. And Keri. And Deanna. And Kryssi. And Elizabeth. And a ton of others. We step in --- and we get attached. At least, as much as we can. We stand in the kids' corner, advocate for their needs, love them as if we gave birth to them, dream, and pray, and hope for them with all our might. And then one day, we have to say Good-Bye. We have to let go and hope that all of our love and sleepless nights and fears and hopes and prayers and meetings and sensory tools and visits and preparations were enough. We hope that we bonded and they bonded to us. We hope that we gave them the gift of the ability to trust others. To believe in their own worth. To know they are loved. To know that God has never forgotten them. To know that there is something to love and relationships outside of abuse and neglect. In short, getting too attached is one of the best gifts we could give these kids. Even if it hurts to say good-bye. If being a foster parent sounds like it's just setting yourself up for hurt... I want to challenge you. These children did not choose to be foster children. Their lives are completely up in the air, and are dependent on total strangers' decisions. When you guard your heart so carefully that there is no room for them in it ... They do not disappear. When you dismiss their plight with a wave of your hand and a quick excuse, they are still without a home. Just recently, at one given time, there were 150 children in my county that needed a home. 30 of them were placed in our county. 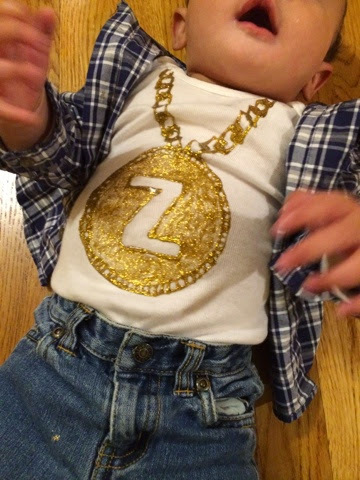 Baby Z was one of them. The other 120 had to be shipped off to other counties... Far away from everything they already know. Foster families who are already stretched thin take in one more kid because no one else will. Social workers have the kids sleep on sofas in their offices until they can find a home, somewhere. Siblings are broken apart and only get to see each other every once in awhile. So maybe ask yourself ... What if I could. What if I could get attached, love a child, and say good-bye? What if I could give a kid love and stability because that's what our home is made of? What if there is a child out there who is worth the risk of getting my heart hurt? I can promise you one thing ... There is. There have been two for me. And when it comes time to say good-bye to this sweet precious thing I'm holding in my arms as I write ... I know he is worth every single tear I will cry. To read more about foster care, and the start of our journey, start here "Fostering-to-Adopt: Our Story, Part 1." Oh my gosh this is such a wonderful post. Put a lump in my throat and a tear in my eye. You explain some very important and excellent points that I would venture most people wouldn't even think of. I think Leyla and Baby Z are super fortunate to have you as their foster mom. Thankfully, we adopted Leyla. So I get to be her forever mom. That was the plan going into her case... 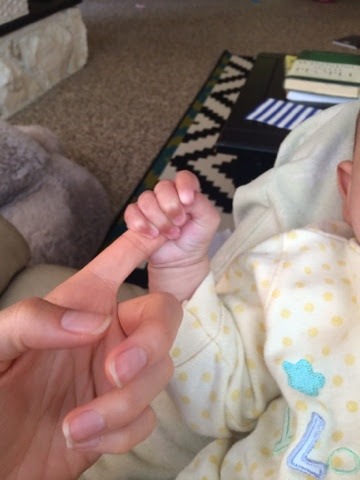 But for Baby Z, the plan is to foster only. I have yet to go through the good-bye experience ... But like I said, I know Baby Z is worth whatever it costs me. Our family got a baby at 7 days old. He left just before he turned 1 year. I asked the pediatrician how I could make his life good, so he wouldn't develop Reactive Attachment Disorder, as my other two adopted children had. The Doctor looked at me, said, "love him as much as you can, and cry when he leaves." And that's what we did. 5 years later, my boys and I still talk about "Putsie," and how he would have changed. I miss that baby every day--but I wouldn't have given up taking care of him for that year for the world. What you do matters far more than people realize. You're wonderful. Wow such a powerful post! Rachel you have such an amazing way with words. Definitely made me think of some things I had not considered before. Thank you for always sharing so honestly, I always look forward to your new posts!! Thank you so much for writing this. I have been wondering how we will let go and if we are even making an impact in the meantime. I know we have bonded to them and they have to us. I have been worried about the pain they will have leaving us eventually and going home. A good thing but so hard to move yet again. So thank you so much for this perspective. It comforted me today. I'm so glad it has comforted you. Let me know how you get along after the transition. Hoping the best for all of you. I love this line: "I am not some woman with the super power to love and attach only to the extent that it won't hurt me. " What a wonderful post. Thanks, Mel, always for reading and your thoughtful comments. This - "What if there is a child out there who is worth the risk of getting my heart hurt?" - will make us completely rethink our attitudes towards fostering. What a beautiful post. I found you through Mel's roundup, and while I have always been open to fostering - I think you may have just sent me in motion to start the process. This is so beautiful, thank you for sharing! Rach, glad you read me, and excited for your journey... Wherever that takes you! Keep me posted! I hope so, Rach. It is the "toughest job you'll ever love!" And thanks for your post Rachel Lewis. Really powerful post... It makes me think... Thanks for sharing and for being a special Mom to your kids. Thank you for this post. We plan to start the steps to be foster licensed next year with the intent to adopt if the situation presents itself, and this makes it... not less scary because it's still scary... but do-able. This is a beautiful post and express so clearly how we as foster parents think and feel. I too am a foster Mum and I too have said goodbye to precious ones when they have been adopted. There really is no way to describe the bitter sweet feeling of a foster child being adopted, the pain you feel as you say goodbye to a child you love while at the same time rejoicing that they now have a family to call their own. It has taken me some time to not be offended by the "I would get too attached" statement. It used to make me feel like people thought that I didn't get attached to the kids and this lack of understanding would make me mad but now I know that they can never really understand, that only others who have fostered and released children who they loved as their own will ever understand. I am thankful for God's love and His grace in my life and for the beautiful children He entrusts into my care. Bless you as you continue to pour your love into these children, what an honour to be in their lives for even a short while, what an honour to love them. AMEN sister. Thank you for your words. Rachel...Friend...I love your heart. I completely resonate with every word you said. When we fostered attaching and saying goodbye was obviously something we didn't want to do...but then it happened 10 months later. I looked at our goodbye as temporary, because I still feel very much connected to her..through my memories, imagining where she is in her life and mostly through the prayers I pray for her. Lovely post and wonderfully insightful perspective. Thank you for sharing! Love this, it needs to be sad over and over again! We are adults, we can handle a little heartache or heartbreak to help a child potentially thrive. These children have no choices and no options, they need to be placed with people who can love, let go and do it all over again with another child, the attachment is crucial! Thank you for writing this, great job! We intend to foster to Adopt...and after adopting a few we will continue fostering others as long as we can. as a woman who cannot have bio children I need to adopt a few that we can keep forever. it may be selfish but I need that. That's not being selfish. The kids need to know they have a "forever home," and that they're loved and wanted. I had foster parents for 10 years . As a childI was the fortunate one to have had a loving family. There isn't 1 day that doesn't go by that I don't think about them and miss them. They taught me how to live my life in a good way. I am not so sure if I had been allowed to stay with my bio parents that my life would have been so much differential a bad way. The foster system where I was raised was to help the small farmers to stay at home and provide a living for their families from the land. I am so grateful I had this back ground to rely on because I went on to have 6 children and my knowledge enabled us to get through some pretty hard times. I thank the foster care program for their care and concern if children . I have been a foster parent for almost 4 years, and we are going to be adopting this latest set hopefully on Jan 15th. After this though, we are done and will never do it again. All you say is true, and good and right, yet the system is so messed up, until it is fixed until foster parents rights are respected, until the laws and the people running the system realize the importance of the input of the foster parent (you know the people who love and support these children 24/7 not just one more monthly visit, not just one more required thing before they come up) we just won't be doing it anymore. The rules we are required to live by, the unannounced visits, the belittling, the "blackballing" if you hire a private lawyer to fight in behalf of these children, the constant criticism, the plain stupidity of the system-- we will not be doing this again, and won't be advocating anyone do it, until we can make serious changes to the system. I so agree,the system is messed up big time.I was a foster parent for many years but never again.In the end the children do not really matter to the system,it is always about parent rights..
My son and daughter went through fostering and adopting six children. There were many ROUGH moments in this journey. And I too agree the "system" needs a major overhaul. BUT while the system is imperfect, a child still needs a safe and loving home. My children changed my negative attitude towards the "system" with these words. Mom, we're not in this for the "system", we're doing this for the children God places in our home and hearts. The children are what matters. And God will bless those who are able to take the step to care for HIS children. My son and daughter have fostered and adopted six children. And yes, the "system" is imperfect. The journey and decision to foster is not easy. BUT God's children do matter to those that foster. The children still need a safe and loving home. An imperfect system won't change that fact. So please, tackle this imperfect system--do it for the children. They are indeed worth all the love you can give them. As my son said, he was amazed by God's thought. Fostering and adopting changes generations. My children had to help me get past the system. They told me they did this for His children. Will pray! So excited you're thinking about fostering! I just handed my beautiful 9 month old foster daughter , I have had from birth to her mommy to go home today and yes I cried and cried , but I knew from start this is what we do even if it breaks our heart she is alive happy and knows love . she is worth all my tears to get he chance to love her , I wouldnt change it one bit evn though my tears , she was worth it . I was told the same for years and I only had four of my own. I was adopted into a large family so it was the norm for me. They wouldn't listen. We later became trained as Therapeutic Foster Parents. Last year we adopted a sibling group of three and just this month we were given another sibling group of two. Don't give up! Try therapeutic level - most older than 10 but wonderful children! Beautiful post.. thank you for writing it. My husband and I were foster parents and had five precious children that we had to say goodbye to. Of course it is never easy, and we prayed like mad that they would be safe, loved, and happy, and that their time with us made a difference for good in their lives. And yes, our hearts broke. But, as someone once told us, it is better that our hearts break than theirs. Children need love. Best post! I wish I had run across your post before our foster care/adoption recruitment event. I hope you don't mind me sharing this. I am a brand new foster mommy and I feel such a responsibility to explain to people why we do what we do. (I don't know, I think everyone should experience this and that somehow the very words I say will miraculously make all of them run out and get their certification!) It is so difficult to put into words sometimes. This was so beautiful and spot on. Thank you. :) I will be so much better prepared when people come at me with the "I would get too attached" comments. What a touching and wonderful story. Thank you for sharing. My wife and I did foster care for many years and we were blessed to keep 2 of them. Saying goodbye hurts but hopefully we have given them enough to be a better person when they grow up. Hello, my name is Faizah Downing and I live in California. Your post made me cry. I want to be a foster parent because I want to help babies and kids who are abandoned, without a family and home, but I have so many questions, doubts and fears... How can I contact you to know more about being a foster parent? Thank you! My kids are Native American (Sioux.) So, we taught them that once someone comes into your life, they are part of your "tioshpaye." (kinda like a "family circle".) Once you are in the tiyoshpaye, you have "citizenship" in that tioshpaye for life. So even thoug their bio parents don't live with them, the parents are still part of the tioshpaye. Putsie, and the other kids we've fostered, don't live with us any more, but they are still part of our tioshpaye. We define it loosely as "an ever growing circle of people who surround you and love you, and that love never goes away,"
Very well said! I've been fostering for 21 years and have had 40 babies. I adopted 2 of them, but the other 38 I had to say goodbye to. It never gets easier. You just love them with everything you've got and cry when they leave, but I know in my heart that I made a difference in those babies 1st and sometimes 2nd year of their lives. It is the most rewarding job I've ever had! 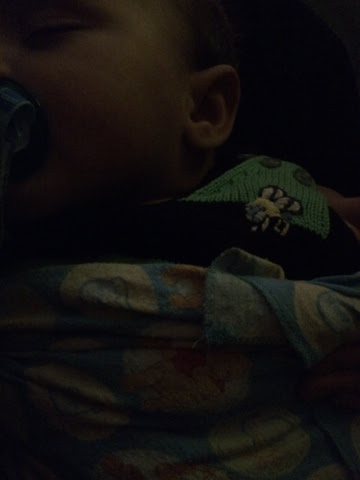 The baby I have now has been with me for 15 months and will go home in the next 2 months or so. Then it's time to wash, clean, disinfect and prepare the room for baby #41. Sadly,it's an unending cycle. I just wish there were more people out there that were willing to take chance to make a difference in a child's life. Very well said. Don't ever back down, these innocent children are worth it. Great post! I'm a foster parent in MN and hear the same thing all the time! Right now I have a newborn baby boy and it's impossible not to get attached to five tiny pounds of sweetness. But, he needs someone to get attached so that he can survive! Bless you. We said goodbye to our foster daughter today. By far the hardest thing we've ever done. Your blog post was shared on Facebook and I happened to see it today, the day I needed to hear these words so desperately. Thank you for sharing! Bless you Jessi! How are you doing now? Love your post. We've had 3 foster kids and got to adopt one of them. Just one thing I'd like to add. The US hasn't totally done away with orphanages. They are now called children's homes and they are filled with kids who are so damaged from lack of love and bonding that they can't function in a normal home as a part of a family. My mother and step father were foster parents for just over 20 years. They fostered 150 kids during that time and adopted 15. As someone who grew up with foster and adopted siblings that it taught me to love better. It also taught me to appreciate what I had. I think what your doing is amazing, but please understand those of us who choose to not foster or adopt don't just dismiss away the plight of these children. I too have had my dreams of motherhood crushed, now they are replaced with parenting four homeless animals. I don't judge you so please don't judge my choice. My parents were foster parents when my brother and I were growing up. From the perspective of the bio children in a home with foster kids, it was great to grow up with other kids to bond and learn with. It was sad when it was time for those kids to go, but I understood, even at a young age, that I had one forever sibling and the others were there to learn, grow, love and be loved before they moved on to their forever family. Now my husband and I live next door to a foster family - who shared this post on fbook, and I'm so thankful for that because it was an amazing read! This family is amazing and full of love with such a level of selflessness that I feel so fortunate to share in their story and the story of their foster kiddos. Awesome. 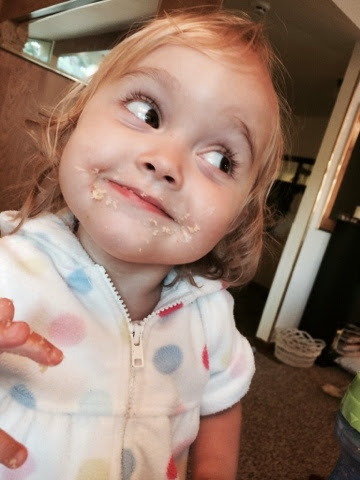 We just said goodbye to our foster daughter of 14 months. I'm afraid I got too attached. I'd also do it all over again, in a heartbeat. You know? I love this post! My family has done foster care for 15 years and have had 20 different youth in our home. Some have stayed in contact and are still a part of our family and others we had to permanently say goodbye to. We have shed many tears when we have lost some of our children but I would not change the time that we were able to love them as part of our family and share God's love for them! It does hurt when they leave but it is worth it for every opportunity to love another child. Foster care gives us the opportunity to love, shows foster children they are loved, and teaches our own children to love deeper! If there is anyone that has thought about fostering but thinks it would be to hard to "loose" them, please stop for a second and think of how wonderful it would feel for a child who has nothing, to "gain" a home to live in and a family that loves them, cares for them, protects them and even just wants and values them! For me, as I look across the room and see our own 3 children and our 3 foster children, the choice becomes so clear, we will continue to love being one big loving family! May God richly Bless you all! Becoming a foster parent has been one of the greatest things I have ever done. We have now fostered 9 teenage girls in our home. I commend you and all the other foster's out there, and I'm grateful we are willing to get attached! Our mission is to recruit nurses to become foster parents to care for our growing population of medically fragile foster care infants and children from their homes. Moreover, we created a State Law in California that nurses get "Priority Consideration" for the placement of medically fragile foster care infants and children, we all know these precious souls need to go into the homes and hearts of nurses vs. going into group homes, institutional care settings, or with numerous less-educated or poorly supported foster care homes who can not meet their medical needs. I am reaching out to you for your permission to repost your letter and photos on our Global Giving project site which will go out to thousands of donors. If you're interested in giving AIW this permission please contact us through our website under our "contact us" page. With the deepest of respect, thank you for writing such a beautiful heartfelt article. Somehow I missed this. Yes, you may reprint... Message me if you need any details. Renyeart@hmail.com. Sorry for the late response! As a foster parent of at least fifteen precious souls and an abused child myself I always hated that comment. I wanted to explain how much harder it was for that lonely scared child to say goodbye to the comfort and security they had found in our home. Also how short stays in homes with real love had shown me something I wanted so badly that I was able to break the mold and find a peaceful Godly life because of their willingness to hurt for me. Thank you thank you thank you. Due to a horribly abusive situation, my three daughters were placed in foster care for 6 months while I got on my feet. I am forever grateful for their foster mom, who loved them like their own. I thank God daily for her, and people like you, who give the kids who didn't ask for their situations the love that they need. Love your comments, we are on our fourth foster child and miss the three who have gone back every min. Luckily we still have contact with two of them. Attachment IS the point, we are struggling right now as a close family member has chosen to criticize our choice to foster, not the way we hoped our Christmas season would go as we obviously are not going to expose our already wounded little one to all that! keep up the good work, God bless all of you. Foster parent too. Thank you, this is very well said. I always say its like being a teacher, you are there for them when they need you and you are preparing them for their next stage, yes you are sad to see some leave but you know you have prepared them well. My husband & I have been fostering baby girls for the past 7 years. It has brought many blessings & much joy into our lives. Yes we do get very attached but honestly believe if you don't get attached you shouldn't be doing foster care. We currently have a 2 month old preemie that was born on my bday Oct 8th and she is doing remarkably well. We also have a sweet toddler who will be 2 yrs old next month and have had her since she was 5 months old. It does pull the heartstrings when they leave our home but the joy of getting to love & nurture them and give them a great head start in life is far more important then any heartache fostering will bring. Keep up the great work all you foster parents and PLEASE PLEASE people,, consider fostering, the need sadly is GREAT! I read this and have to admit, I got a lot of anxiety. I want to foster, but I'm terrified of having to give up a child to what I think is a situation worse than the home I could provide. I have two kids too and would care and love this child as my own; I can't imagine the crushing pain of losing my child. I'm worried and still debating whether to be a foster parent. On a sidebar, I have another concern I hope some of you foster families can address. I have two small children and am worried about their safety with foster kids with behavioral challenges? Is this something to seriously consider or just another one of the myths of fostering and adopting? I have those same fears. I have two adopted children (13 years apart in age) and while we were waiting for the second (her biological parents are friends of ours, so they specifically placed with us; our older boy was placed with us just after birth by his birth mother who decided to place him before he was born, and she chose us out of all the other families she met with), we looked into fostering to adopt for a number of years without being placed with a child. We didn't care about age, but our circumstances and living arrangements (in our state) meant that we most likely would be placed with a boy and likely an older child (we were looking anywhere from birth to 8 years old at the time). We want to be a permanent home and family for our kids, and not only would we feel badly about the disruption in the child's life as they bounce around from place to place, but we didn't want our son to have to go through that constant disruption as well. He would have a brother for a few months, or even years, and then that child gets ripped away from him, too-- not just us. 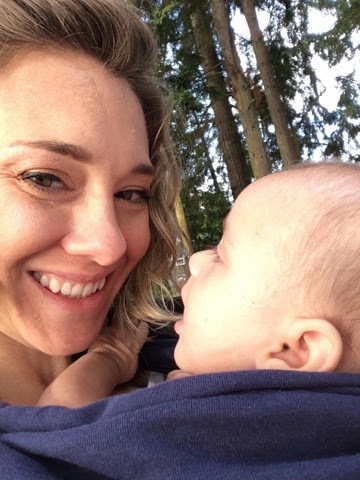 We didn't think that would be a good situation for the child we had permanently living with us, and I know I would have a very hard time relinquishing a child. I also know from the statistics in our area that so many kids unfortunately go back home to their biological parents, and then end up back in the system and back with a _different_ foster family. That would absolutely kill me. When we were looking, a lot of the profiles of the kids have notes about whether or not they can be placed with a family with younger or older children, or if they should be in a home with no other children. Their case workers and doctors try to be pretty thorough in what situations they would do best in, and what situations might trigger problems, and when you work with the kids case-workers, they will talk with you about your home, your circumstances, and they will ultimately make a decision about whether the child is a good match for your family situation. We looked at 19 children in 10 months, and the few case-workers we heard back from for one reason or another (mostly distance between us and other biological relatives, which we wouldn't want to disrupt) we weren't a good match for those kids. I have a lot of the same concerns as you, and similar circumstances-- I would say look in your area for foster-to-adopt situations (there are situations where reuniting with the biological parents is *not* the goal and not the optimal solution) and those caseworkers will better be able to match a child with your family as-is. I don't know where you are, but where I am (Chicago) we have a _very_ good foster training program (we took it twice, with each of our kid's adoptions-- it's part of the training you have to complete to have your home study complete), and it was *extremely* helpful in understanding the kinds of trauma foster kids endure before getting into the system, and likely behavioral problems you'd encounter. See if your area has something similar, or other resources for fostering-- sometimes you really have to dig to find those resources or support groups. Good luck! I very much admire those who can withstand the heartache to let the children go back. Maybe in a few years, I'll get to that place. In the meantime-- I try to work with the young people who are aging out of the system without a permanent family. Those young adults often need so much help and support because there are basic life skills that they simply never learned because they haven't had a permanent family to help them through things that most people really don't think about: applying for work, college, an apartment, managing their bills, etc. If you can't foster a child, for whatever reason, then _please_ think about being a life-mentor for a teen getting ready to age-out of the system-- they really need the kind of help and guidance a family would have provided them. Thank you! Preaching on this in a couple weeks and your words are extremely affirming and painfully beautiful. Im not license as foster parent but a baby boy was place with me by mom when he was 1wk old. Yes im going through the whole proses to get license :). The baby boy is now 2yrs n he is the world to me. The plan from day 1 was adoption bio mom said that was the best thing to do. Bio mom had another baby his now 2mo. N 3wks. Place with me at 4days old by the state this time. just yesterday I received a call from the case worker dad wants him back. He only has come for 1 visit since baby was born. After work yesterday I just sat in my car cry for a long time. reading this has motivated me to be strong and is not the end of anything is the start to a new journey. After I get license I would love be a foster parent. This would just be part of the learning process. And the thing is, if you can just open your heart a little bit more, you can make a difference in the lives of these kids but also the lives of their bio families. I am still in contact with the bio mom from my first placement and it is so cool to see God's redemption story played out in their family!